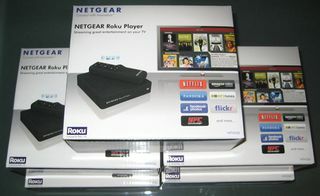 Thanks to the folks at NETGEAR, I have five Roku NTV250 players to give away to some lucky readers of my blog. The Roku platform supports content from Netflix, MLB and Amazon On Demand amongst others, with support for Hulu Plus and the NHL coming soon. To enter the drawing, all you have to do is leave one comment on this post and make sure you submit the comment with a valid email address. The drawing is open to anyone with a mailing address in the U.S. and I will select one winner at random on November 22nd December 3rd. I’ll then give away the other four in further drawings each week. Good luck! « Free Product Giveaways: Roku, Apple TV, Boxee, Logitech Revue, Harmony Remotes and More!